In this tutorial, you’ll learn how to use the Entity Framework Core Generator to create an Entity Framework Core data model for an ASP.NET WebAPI. Entity Framework Core Generator (efg) is .NET Core command-line (CLI) tool to generate Entity Framework Core model from an existing database. This tutorial will be a database first model. The database is a simple task tracking database. The DDL script can be downloaded here. To create the database on your local SQL Server, run the following command. You’ll need a few nuget packages for the mapper and validation classes. To use Entity Framework Core Generator, you need to install the .NET Core Global Tool. Entity Framework Core Generator has many options available to customize the generated output. The initialize command is used to create the configuration yaml file and optionally set the database connection string. Update the configuration file to configure the generated output. The following command will create an initial generation.yaml configuration file as well as setting a user secret to store the connection string. The EntityFramework DbContext file will be created in the Data directory. The Entities directory will contain the generated source file for entity class representing each table. The Mapping directory contains a fluent mapping class to map each entity to its table. Entity Framework Core Generator has an option to create view models for each entity. The output will go in the Domain directory by default. Entity Framework Core Generator supports safe regeneration via region replacement and source code parsing. A typical workflow for a project requires many database changes and updates. Being able to regenerate the entities and associated files is a huge time saver. The code generator makes its best attempt to convert names to there plural form using the Humanizer library. In some cases it fails. 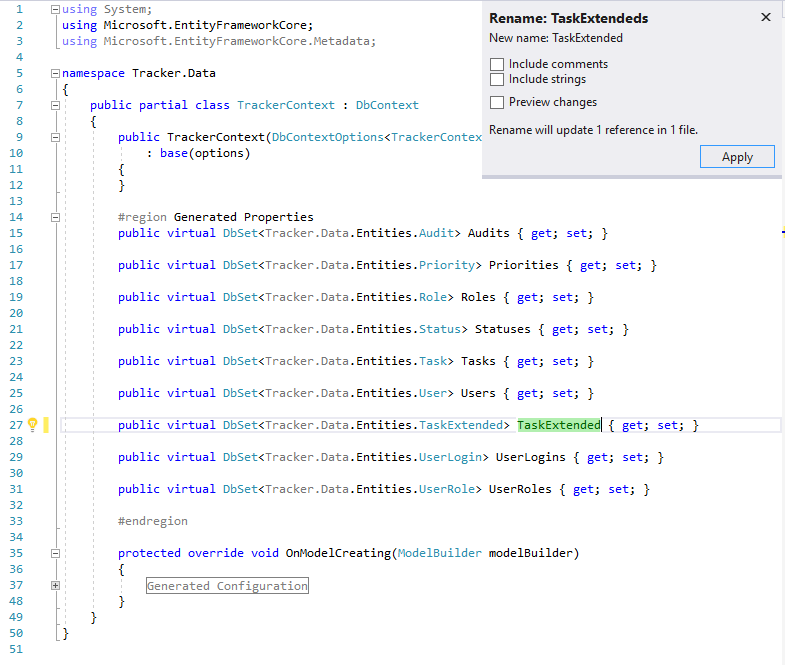 The first cleanup to do is to rename the TrackerContext.TaskExtendeds property to TrackerContext.TaskExtended. When the generate command is re-run, this refactor will be saved. In order to handle entities in a generic way, we’ll need to add some interfaces to them. We’ll add the IHaveIdentifier to all entities and models. Add the interface to all entities that have an Id primary key. Below is an example entity class with the interface added. Notice the file has some regions like #region Generated .... These regions are what get replace the next time efg generate is called. Since the interface was added outside of those regions, it will not get overwritten. Read more about regeneration in the documentation. 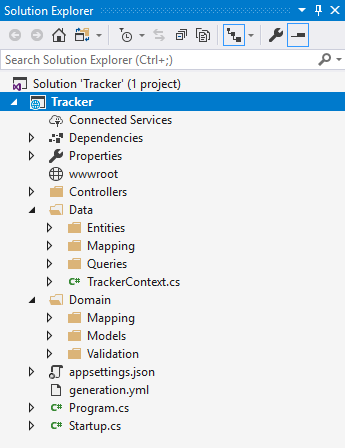 You’ll need to add a few more things to your Web API project to get things going. You’ll need to change the application startup to register the Entity Framework context as well as register the AutoMapper profiles. 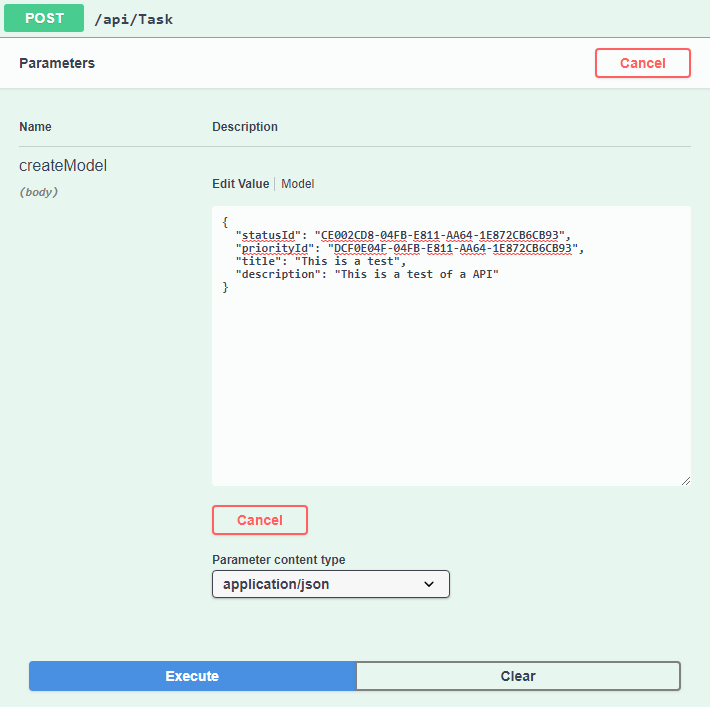 // Enable middleware to serve swagger-ui, specifying the Swagger JSON endpoint. To make the basic read, create and update endpoints easier, create a base controller class like the following. Create a TaskController to Create, Update, Read and Delete tasks. Now that you have the basic Web API project setup, you can run efg generate after any database change to keep all your entity and view models in sync with the database. .NET Core command-line (CLI) tool to generate Entity Framework Core model from an existing database. Replace <ConnectionString> with a valid database connection string. The EntityFramework DbContext file will be created in the root directory. The initialize command is used to create the configuration yaml file and optionally set the connection string. The configuration file has many options to configure the generated output. See the configuration file documentation for more details. When a generation.yaml configuration file exists, you can run efg generate in the same directory to generate the source using that configuration file. All the templates output a region on first generation. On future regeneration, only the regions are replaced. This keeps any other changes you’ve made to the source file. When the generate command is re-run, the Generated Constructor, Generated Properties and Generated Relationships regions will be replace with the current output of the template. Any other changes outside those regions will be safe. In order to capture and preserve Entity, Property and DbContext renames, the generate command parses any existing mapping and DbContext class to capture how things are named. 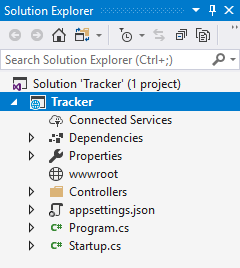 This allows you to use the full extend of Visual Studio’s refactoring tools to rename things as you like. Then, when regenerating, those changes won’t be lost. Entity Framework Core Generator supports the following databases. The provider can be set via command line or via the configuration file. 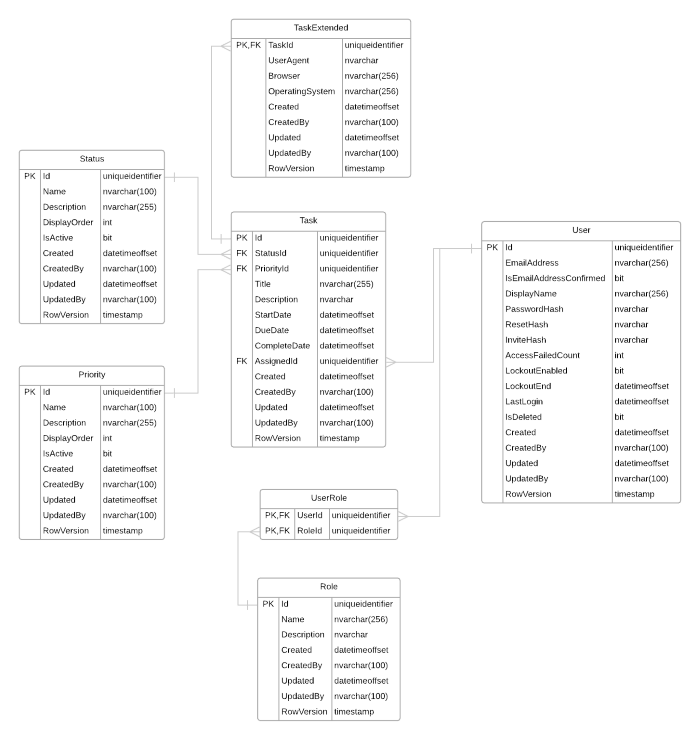 The database schema is loaded from the metadata model factory implementation of IDatabaseModelFactory. Entity Framework Core Generator uses the implemented interface from each of the supported providers similar to how ef dbcontext scaffold works. Entity Framework Core Generator supports generating Read, Create and Update view models from an entity. Many projects rely on view models to shape data. The model templates can be used to quickly get the basic view models created. The model templates also support regeneration so any database change can easily be sync’d to the view models. The EntityChange library is available on nuget.org via package name EntityChange. Configure the Contact properties and collections. The MongoDB Messaging library is a lightweight queue pub/sub processing library based on MongoDB data store. The MongoDB.Messaging library is available on nuget.org via package name MongoDB.Messaging. A queue is equivalent to a MongoDB collection. The name of the queue will match the MongoDB collection name. Queue names must be alphanumeric, without spaces or symbols. It is a good practice to suffix the queue name with Queue. A message is the high level object that is a generic definition of a messages. The message contains processing level information. 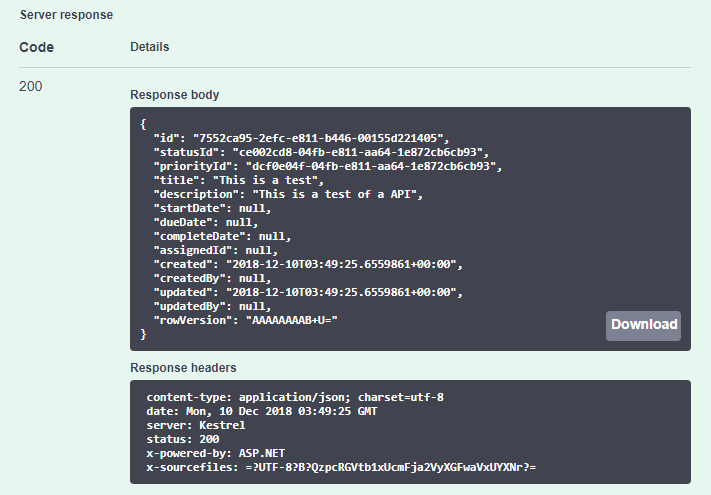 The message object is automatically created and updated by the Fluent API and should not be updated directly by the publisher or subscriber. Data is the message payload to be processed with the message. Use data to pass information you need to process the message. The data object must be serializable by MongoDB driver. It is a good practice to have one queue per data object being passed to limit confusion and to maintain simplicity when subscribing to the queue. Publishing a message adds the message with the corresponding data to a queue for processing. In order to process a message on a queue, an application needs to subscribe to a queue. There can be many subscribers to a queue to scale the load across processes. A subscriber can also set the worker count to scale the number of processing threads for that subscriber. The framework ensures that only one subscriber can process a messages. The queue configuration is used to set default values on messages published to a queue. An example of using the fluent api to configure the sleep queue. Connection is the app.config connection string name used to connect to MongoDB. Name is the name of the queue to configure. Retry is the number of times the message should be retried on error. Set to zero, default, to not retry. Priority is the default priority to publish the message with. ResponseQueue is the name of the queue where responses should be sent. To publish a message to a queue, use the fluent api. Queue is the name of the queue to publish to. Data is the object to pass in the message. Used to process the message by the subscriber. Correlation is an identifier used to link messages together. Description is a user friendly description of the message. Retry is the number of times the message should be retried on error. When setting the Data property, the message Name will be set to the Type name of the data object. When setting the Data property and Description hasn’t been set, the data object ToString() value will be set as the description. To subscribe to a queue, use the fluent api. The subscribe handler must implement IMessageSubscriber. Handler is the class that implements IMessageSubscriber. This is what processes the message. Workers is the number of worker processes. ExpireError is how long to keep error messages. ExpireWarning is how long to keep warning messages. ExpireSuccessful is how long to keep successful messages. PollTime is the amount of time between work polling. If using Triggger, set to longer time. Retry is a class that implements IMessageRetry. IMessageRetry controls if an error message should be retried. Timeout is the amount of time before a processing message times out. TimeoutAction is how to handle timed out messages. Options are Fail or Retry. Trigger to enable monitoring of the oplog for changes to trigger processing. In order for the message subscribers to process messages off queue, the MessageService needs to be created and Start called. Note, the MessageService.Stop() method tries to gracefully stop by waiting for active processes to finish. The IMessageRetry interface allows for customization of the retry of failed messages. The library has supports distributed locks. The following are the lock types supported. This is an example of using the DistributedLock. The DataGenerator library is available on nuget.org via package name DataGenerator. DataGenerator support class profiles to make configuration easier. To create a profile, inherit from the MappingProfile<T> base class.